No one under the age of 14 is allowed to play bingo or purchase cards. You must bingo on the last # called and that # must appear on the winning bingo card. Players may call in as soon as they see their number on the TV Screen – Your bingo will not be official until the number is called. There will only be a 15 second interval between each number called. Any disputes must be settled during the bingo in progress. We do not accept personal or third party cheques. We are not responsible in case the phone lines are not working. There are no refunds or exchanges on bingo cards not played. Members of the Licensee, and their immediate families are allowed to participate in the bingo event. Cards cannot be sold after the game has started. Cards will only be sold until from 4:00 P.M until 6:45pm on bingo days unless otherwise posted. All bingo paper is controlled by serial numbers. Only the first 5 numbers will be repeated. 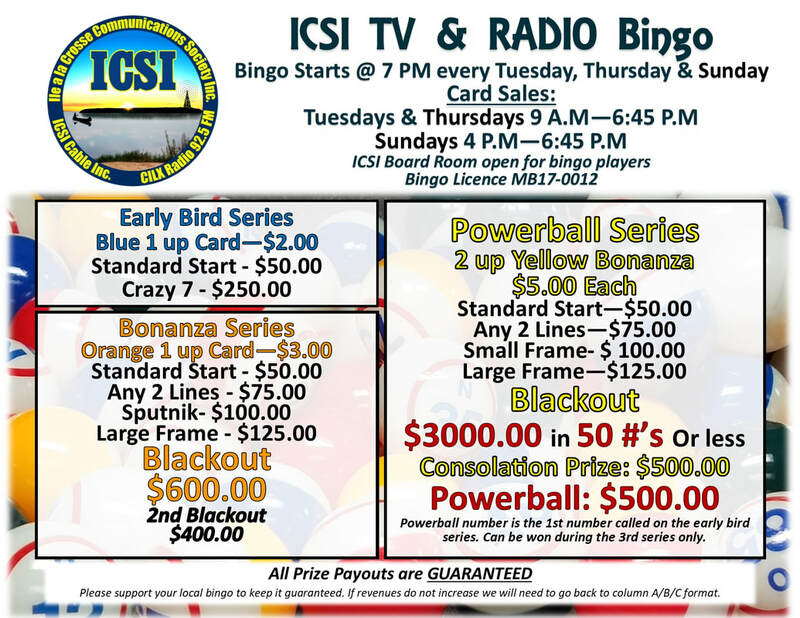 Any unclaimed prizes will be held by ICSI for a period of 1 year from the date of the bingo event. After a period of 1 year the unclaimed prize will be donated to a charitable beneficiary approved by SLGA. The number to call should you bingo is 833 2173. Winners are required to give their full proper name and phone number. In the event of multiple winners on a Prize Package – A one-line playoff game will be held. The first to bingo on the playoff game wins the prize and the rest split the consolation amount – The consolation amount will be announced before the bingo. Thank you and good luck to everyone.